Williams submitted his resignation at a school board meeting in which Paso Robles trustees were scheduled to discuss the superintendent’s midyear performance evaluation. 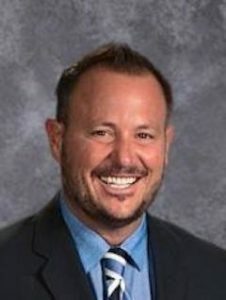 The board voted 6-1 to accept his resignation, and a leadership transition will take place over the next 60 days, according to a school district press release. Prior to resigning, Williams had just received his ninth consecutive positive performance evaluation, according to the district. Williams, who had served as superintendent since 2014, did not give a reason for his sudden departure from the position. “It is with the deepest gratitude that we thank Chris Williams for the passion, purpose, conviction and leadership he has provided in the transformation of our district into one of excellence,” a district statement says. The Paso Robles Press reports Trustee Chris Bausch cast the lone vote against accepting Williams’ resignation. After the trustees accepted the superintendent’s resignation, board President Joan Summers gave remarks that appeared to pin blame for Williams’ departure on a member of the board. “It’s tragic that the momentum of one narcissistic board member who has to have control led us to where we are today,” Summers told the Paso Robles Press. During the meeting, the board also accepted the resignations of athletic director Rich Clayton and student services director Kristin Shouse. It is unclear why the two administrators are departing the school district. Over the course of Williams’ tenure as superintendent, several controversies arose, some involving the football team, which had two coaches resign in a period of less than a year. Also, in 2017, a school board member resigned, citing disagreements with the district, and earlier in the year, the school board voted to censure Bausch. Bausch and the other board members have been at odds for multiple years. The other board members accused Bausch of conflict of interest, spreading misinformation and threatening colleagues, while Bausch accused his fellow trustees of punishing him for his dissenting stances on district matters. Meanwhile, Trustee Joel Peterson told the Tribune Williams’ resignation caught the board by surprise, and it may relate to the results of last month’s election in which multiple incumbents were voted out amid a demand among some community members for change. Peterson said he does not think Williams was in alignment and agreement with the incoming board. Peterson also said he believes Clayton fully supports Williams. The trustee, though, said he was unsure why Shouse is resigning. Time will tell the truth. A real resignation? Or was this another government payoff in lieu of termination? 3 at one time has to raise some questions for sure. So we will see if there was a financial incentive to resign. Do you really have any doubt that a taxpayer funded golden parachute wasn’t given out? It’s the public sector way. I think I know where I would be putting my bet. If a promise for payment occurred it would have been dealt with in “closed session”, and then reported out in the meeting “minutes”, as required by law. These payments can’t be hidden. Additionally, school financial records are available for you, the public, to review if you have legitimate concerns. No need to wonder when facts can be easily obtainable. If termination was discussed in closed session at some point, which is reasonable, and then officially “acted upon” there would be an accompanying “public session” agenda item at a later meeting to address it. The Super or whoever is facing possible termination would be given a public opportunity to defend their actions. It would be advertised in public in advance of the meeting so you, the public, would be well informed. You could even participate in the meeting during public comment section if there was a desire on your part to do so. This was not done in this case; so there was no pending termination on the table—for this meeting. Most likely course is that these employees anticipated these actions with the incoming board and resigned to avoid any public record of pending dismissal- thus they keep their reputation intact. The bigger financial issue is the large salaries given to public sector employees—in the light of day—that concern me. Basing retirement on their 3 highest earning years skyrockets our obligation to the retiree. No need to turn over rocks to find waste it hides in plain sight.